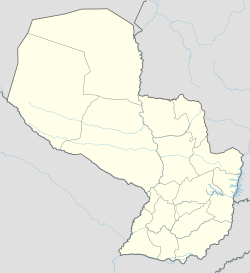 Guarambaré is a town in the Central Department of Paraguay. Guarambaré was the name of a Guaraní tribe in North-Eastern Paraguay at the time of the founding of the Spanish colony during the 16th century. A Franciscan reduction was founded between 1580 and 1600 in the modern-day department of Concepción, south of the river Aquidabán. The reduction was relocated in 1673 to the current location, south-east of Asunción. ^ Torres, Dionisio González (2010). Origen e Historia de los pueblos del Paraguay. Asunción: Servilibro. p. 132. ISBN 978-99953-0-198-9. This page was last edited on 25 March 2017, at 22:45 (UTC).